I am making headway with PSE - I managed to do these LOs in about 2 hrs - so much faster than with paper. I've been wanting to scrap these pictures with this poem and I finally found the right combination of stuff - and I taught myself a few new things tonight as well - so bonus for me. The girls had just gotten their new Crocs and they couldn't wait to wear them. 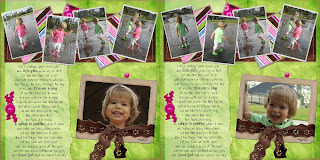 They were the perfect shoes for a rainy day and the girls loved splashing through the puddles.